Crews from Gilchrist Construction Company LLC have been working steadily on the $54.7 million Louisiana Department of Transportation and Development (DOTD) project along 2.7 mi. of Interstate I-10 to reconstruct and widen the four-lane (two lanes in each direction) section of highway. The FASTLANE (Fostering Advancements in Shipping and Transportation for the Long-term Achievement of National Efficiencies) project is part of the DOTD's multi-million dollar infrastructure investment along the I-10 corridor in the Acadiana region. In July 2016 the DOTD stressed the $60 million it received in FASTLANE grant funding from the United States Department of Transportation (DOT) for the overall I-10 project, which is based on three projects. Gilchrist Construction secured its contract with a $54.7 million bid. The work in St. Martin Parish is replacing the pavement on the existing lanes for 2.7 mi. along I-10 from La. 347 to the base of the Atchafalaya Basin Bridge. An additional lane will be added in the westbound direction. The first contract to widen the I-10 corridor, $124.7 million, was secured in December 2016 by James Construction Group LLC. It started its work last April, which has them replacing the existing lanes and constructing one additional lane in each direction for 6.48 mi. along I-10 between I-49 and La. 328. The final I-10 widening project (between $100 and $125 million) is scheduled to be awarded in 2018/2019. The plan is to reconstruct the existing lanes for 4.3 mi., along with the adding of a new lane in each direction, between La. 328 and La. 347. The I-10 corridor currently carries more than 60,000 cars per-day and when completed, will be able to handle108,000 vehicles daily and meet traffic demands for the many years. This is an important section of highway as it provides a direct connection to I-49. The road work infrastructure was designed by Sigma Engineers and Constructors. “There were no design challenges for the bridge structures,” said Nicholas Olivier, DOTD's project manager administrator. “Typical reinforced concrete, precast-prestressed concrete and steel girder design was used to widen the existing structures. 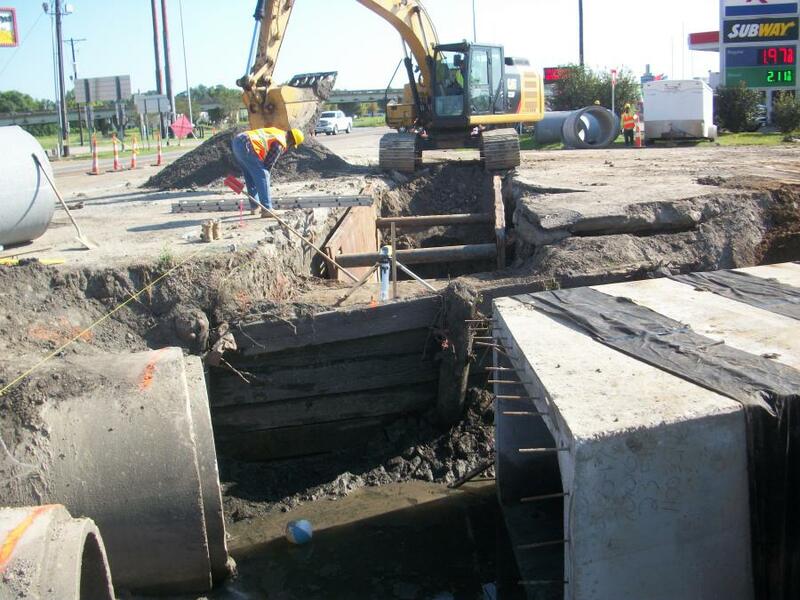 Geotechnical design challenges involved weak soils where piles were driven. Piles were lengthened to tip into the sands, which is a common way to deal with soft soils. Measures are being taken to reduce the long-term impacts of trucks using the road. “From a structure perspective, new approach slabs leading to the bridge ends will be provided having increased soil improvement underneath,” said Olivier. “This improvement is intended to alleviate the 'bump' effect typically experienced at the ends of bridges in Louisiana due to settlement underneath the approach slab. This will improve the wear-and-tear on both the bridge structure and the large trucks carrying heavy loads. DOTD new pavement designs are typically designed for a 20-year period. The traffic management plan is based on temporary traffic control, public information and transportation operations. These resources include signing up for alerts from MyDOTD, visiting www.511la.org or dialing 511 and viewing several localized Twitter accounts that provide up-to-date travel information. Travelers can visit www.dotd.la.gov to access these resources. So far Gilchrist Construction has completed drill shafts, piling driving, drainage work and the detour road along La. 347 and La. 352 Intersection improvements. A key goal for the 2018 construction season is to complete the inside widening of I-10 WB to allow for a traffic switch and start reconstruction of the existing I-10 WB lanes. Another is the completion of the round-about on La. 347 and moving traffic to the new alignment. Traffic is the greatest challenge for the crews. While the work zone appears to be tight, there is space behind the concrete barrier. While deliveries and material removals are done after rush hours, the I-10 has a constant flow of traffic. The majority of the work is done by day. Most of the night work occurred at the beginning of the project. Gilchrist's project manager is J.J. Hickey, who is assisted by Andrew Brady, an assistant engineer, and asphalt superintendent Curnest Guillot and structure superintendent Kent Burnaman. Hickey and his team hold weekly progress meetings with GEC and the DOTD. Buckel, who worked at the DOTD for 31 years prior to his retirement, stressed that communications ensure problems are resolved rapidly, and noted that he has been on several projects involving Gilchrist. “We all know each other and we communicate constantly,” he said. “This past weekend [Dec. 9 to 10] we got snow — very unusual and we needed to get the striping straightened up a little bit. Hickey is pleased with the progress thus far. “Having completed several interstate widening projects along the I-10/I-12 corridors,” he said, “we have learned how to properly plan and sequence the work so that both bridge and road widening can be completed with minimal interference with each other. We have also learned that keeping resources focused on completing sections of a project as we go is often more valuable than spreading out up and down a project just to maximize units per-day. The project includes more than 10,000 cu. yds. of structural concrete, 11,200 ft. of concrete piling and shafts, 530,000 lbs. of reinforcing steel, 150,000 cu. yds. of excavation and embankment, and more that 120,000 tons of asphalt. Gilchrist Construction also will retain and recycle more than 45,000 tons of recycled concrete and more than 22,000 tons of recycled asphalt pavement. 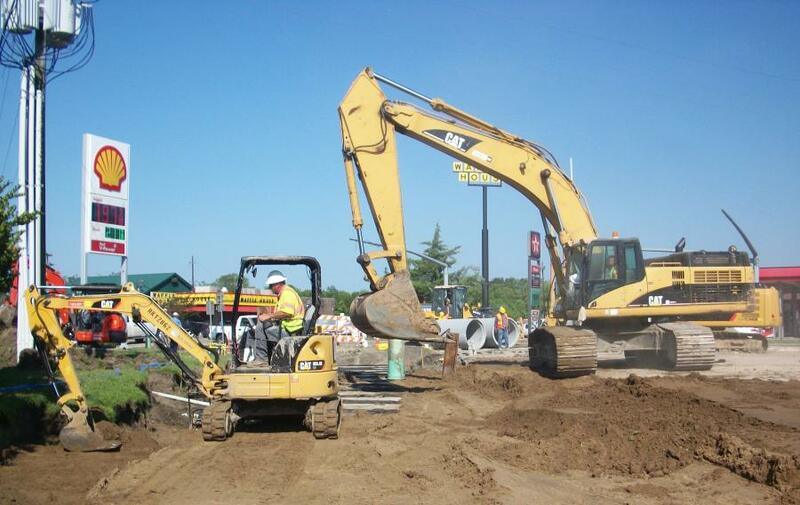 This project has Gilchrist using a variety of cranes: Cat 323, 328, 336 and 345 excavators; Cat D5K and D6N dozers; a Cat 420 backhoe; and a Cat 1055 asphalt paver. The project is keeping the mechanics busy. Gilchrist has onsite mechanics, whose skills are upgraded via manufacturer facilitated training, webinars, and videos. A key aspect of the company's maintenance program is preventive maintenance. Gilchrist purchases equipment from dealerships, including but not limited to, Louisiana Machinery, Head and Engquist and Doggett.